Nearly 500 lots of fine and decorative arts will come up for bid at Nye & Company's Oct. 30 auction in Bloomfield, N.J.
Oil on canvas painting by Wilson Henry Irvine (Am., 1869-1936), titled Stream Drift. Dinnerware will be led by a large selection of Flora Danica porcelain, to include this set of 12 dinner plates. 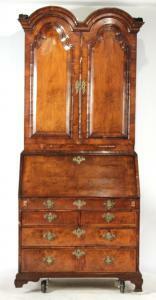 Early 18th century English George I walnut double-dome secretary bookcase. 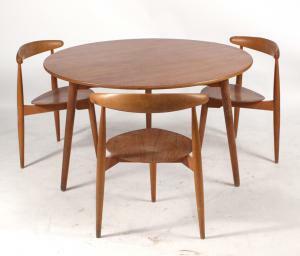 20th century Hans Wegner for Fritz Hansen oak and teak table, plus three stacking chairs. 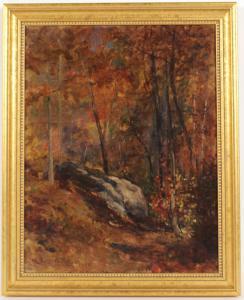 Oil on canvas painting by Louis C. Tiffany (Am., 1848-1933), titled Woods Landscape, artist signed. Nye & Company Auctioneers’ Estate Treasures Auction, on October 30th, will feature quality antiques and collectibles from prominent estates and collections. BLOOMFIELD, N.J., UNITED STATES, October 19, 2018 /EINPresswire.com/ — BLOOMFIELD, N.J. – Nearly 500 lots of fine and decorative arts in a wide range of categories will come up for bid at Nye & Company Auctioneers’ Estate Treasures Auction on Tuesday, October 30th, online and in Nye & Company’s gallery at 20 Beach Street in Bloomfield. Offered will be quality antiques and collectibles, mostly pulled from prominent estates and collections. Highlights include several private Connecticut collections of English and American furniture; items out of a New York City estate, to include art glass and sculptures; merchandise from three North Shore, Long Island estates, including jewelry, fine art and furniture; Americana from a Seal Harbor, Maine collector; and Flora Danica porcelain from a private collector in Michigan. “Following a strong summer with many diverse and disparate consignments, it’s encouraging to provide this varied group of wonderful objects,” said John Nye of Nye & Company Auctioneers. “From Michigan to Maine and New York to Pennsylvania, people are consigning to our current and upcoming auctions.” The full calendar can be viewed online, at www.nyeandcompany.com. The auction will start promptly at 10 am Eastern time. Internet bidding will be facilitated by LiveAuctioneers.com and Invaluable.com. People can bid in person, by phone, in absentia and online. An online preview is underway now, at www.nyeandcompany.com. In-person previews will be held Oct. 22-30 (but not Saturday, Oct. 27) and Sunday, Oct. 28, from 12 noon to 4 pm. 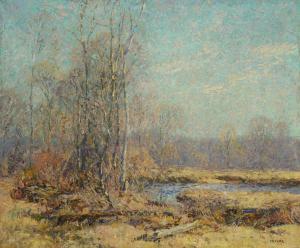 Oil paintings will feature an oil on canvas by the renowned artist and designer Louis C. Tiffany (American, 1848-1933), titled Woods Landscape, signed lower left; an oil on canvas by master American Impressionist landscape painter Wilson Henry Irvine (1869-1936), titled Stream Drift; and an oil on canvas landscape by the noted American painter Dorothea Litzinger (1889-1925). Furniture offerings will include an early 18th century English George I walnut double-dome secretary bookcase; a circa 1800-1820 Federal mahogany secretary bookcase, probably made in Baltimore; a 20th century Hans Wegner for Fritz Hansen oak and teak table, together with three Hans Wegner oak and teak stacking chairs; a 20th century Chinese carved hardwood daybed; and a unique and interesting 20th century carved and painted cheetah-form wood chair from Africa. Sculptures will feature a Beaux Arts cast bronze figure of a dog, titled Beware of the Dog, signed “P. Le Courtier” and dated 1878; and a Black Forest carved wood standing bear figure, probably German and made in the 20th century. Dinnerware will be led by a large selection of Danish Flora Danica porcelain, to include a set of twelve dinner plates and a Royal Copenhagen dinner service. Also sold will be a French Palissy ware plate showing fish and lizards, made by Geoffrey Luff (engraved “GL”) in the 20th century. Decorative accessories will feature a pair of Neoclassical-style crystal oval girandoles; a pine architectural model framing of a pitched roof house on a base; an American 20th century twig decorated planter; a Continental Louis XV-style malachite and hardstone inkwell from the 19th or 20th century; and a lovely pair of Chalk ware fruit baskets, made in Pennsylvania in the 1800s. For more information about Nye & Company Auctioneers and the upcoming auction slated for October 30th, please visit www.nyeandcompany.com. The full color catalog is available for viewing at www.nyeandcompany.com, www.LiveAuctioneers.com and www.Invaluable.com. Previous Previous post: The Rare Earths Investor Announces a New Website Resource for Self Directed Investors.